I want to thank the Mississippi River Commission for the opportunity to speak. I appreciate what you do. And the Corps too. You have a mission impossible. You are supposed to tame the Mississippi River and prevent another 1927 flood. So you developed the Mississippi Rivers and Tributaries Project. It has worked – so far. But you can only tame the river so long according to Mark Twain – and the Corps’ General Jadwin. The MR&T worked in 2016 without major levee breaches and in 2011 too – but with some well publicized trade-offs. There are always trade-offs with the river. I will talk about some today involving backwater and batture floods. (The batture is the land between the riverbank and the levees or adjacent bluffs.) These floods aren’t in the news like blowing Birds Point or opening the Morganza. But they affect the lives and properties of many in Mississippi. And its economy. I have a short video about the flooding problem that I know first hand. I suspect there are others like it in Mississippi. I also have a suggestion to moderate the problem. Who floods? I think floods are acts of God and politicians. God sends the rain. Politicians decide who gets flooded. They tell the Corps: “Save my constituents.” The Corps tries. But someone usually floods anyway – so someone else won’t. The Morganza flooded in 2011 so Baton Rouge wouldn’t. I think Mississippi is flooding more while Louisiana is not. Mississippi’s batture and the Delta are like the bottom of a giant funnel. They hold floodwater until it eventually flows down and out the spout in Louisiana. This gradual release moderates flooding in Louisiana but prolongs it in Mississippi. Natchez and Baton Rouge illustrate the point. Natchez is flooding more. Baton Rouge isn’t. They are 135 river miles apart. Both get floods from the same upriver rains. So differences in rainfall don’t explain the differences in flooding. Natchez has had 3 severe flood years in the last 10 years vs 1 in the prior 10. It has had 2 in the last 5 years. Baton Rouge: 0 in the last 20 years. (Severe floods are 60+ days above flood stage.) The trends suggest more of the same. Flood stage is a good benchmark for levee integrity. The levees have held. The MR&T has worked. Flood stage is also a good benchmark for structure height in the floodplain. Most houses there are now above flood stage as the video showed. High houses and high levees can survive crests above flood stage which tend to be short. It’s the longer lower stage floods that are a big problem. They occur well below flood stage. Long lower stage floods. 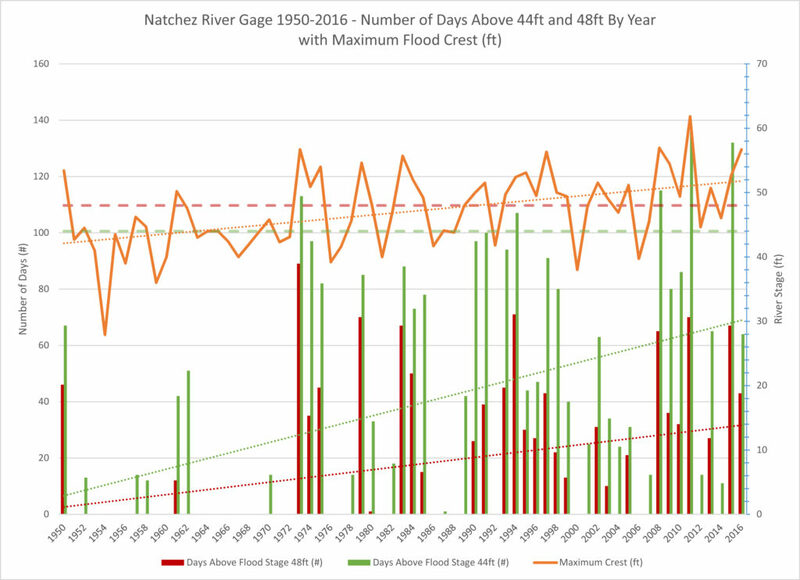 For example, the batture south of Natchez floods at 44′ vs 48′ flood stage. These floods limit and increase the cost of access, recreation, farming, timber, oil exploration and production, and other activities there. They discourage investment, impair property values, and reduce related trade and commerce. These effects ripple through and hurt local economies and the state. 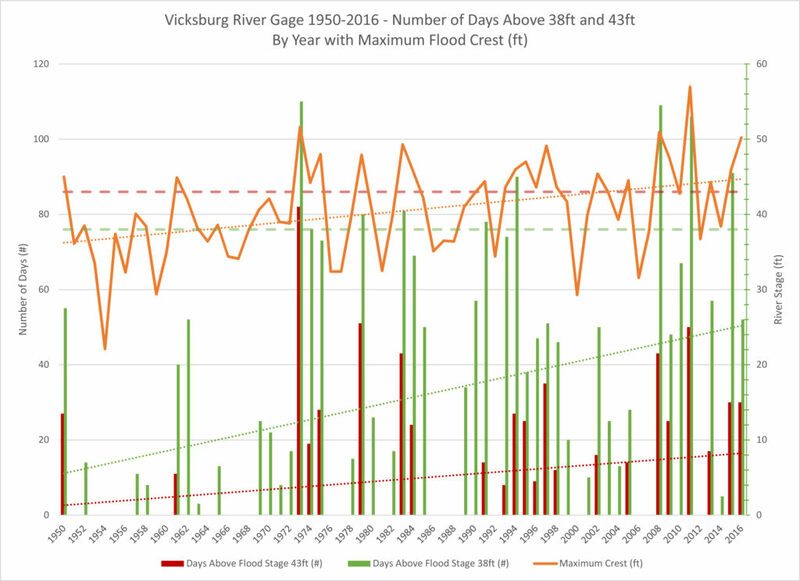 Prolonged lower stage floods are occurring more frequently. In the last 10 years there were 6 years with floods over 80 days including 3 years over 110 days. In comparison, there were 2 years over 80 days in the prior 10 years. Floods have lasted over 4 months in 2 of the last 5 years. The trend is ominous. Batture flooding north of Vicksburg and backwater flooding in the Delta are similar problems that affect over a million acres. I understand this flooding begins around 38′ on the Vicksburg gage. The river has been higher than this over 90 days in 2 of the last 5 years 3 of the last 10 years vs 0 years in the prior 10 years. The trend is alarming here too. What causes this prolonged batture and backwater flooding? It starts with rain. Levees and channelization may aggravate it. (More flood for less rain.) The higher the flood, the longer it takes to drain. I assume rains (acts of God) and levees (acts of politicians and the Corps) are not going to change. So what could change that would help? Open the drain. The obvious answer is to drain the water faster. Speed it to the Gulf to shorten the floods. How? Let more water out of the river’s spout. Where? There are four possibilities: the mouth at New Orleans (maxed out), the Bonnet Carré and Morganza spillways (emergency use only to protect New Orleans and Baton Rouge) and the Old River Control Complex. It diverts about 30% of the Mississippi’s flow to the Atchafalaya which speeds it on to the Gulf. Old River could divert more flow to empty the funnel faster. This would shorten floods and lower crests upstream and downstream. However, the 30% was set by congress in 1964. It’s outdated now due to changes by the Corps and Mother Nature over 60 years. More flexibility. I think the law should be revised to give the Corps flexibility to vary the flow within a wide range: divert more to moderate floods and less to maintain navigation during low water. I have asked Congressman Harper to support this. (His district includes the batture south of Vicksburg.) I imagine the Corps has thought about this in the context of keeping the main channel the main channel. 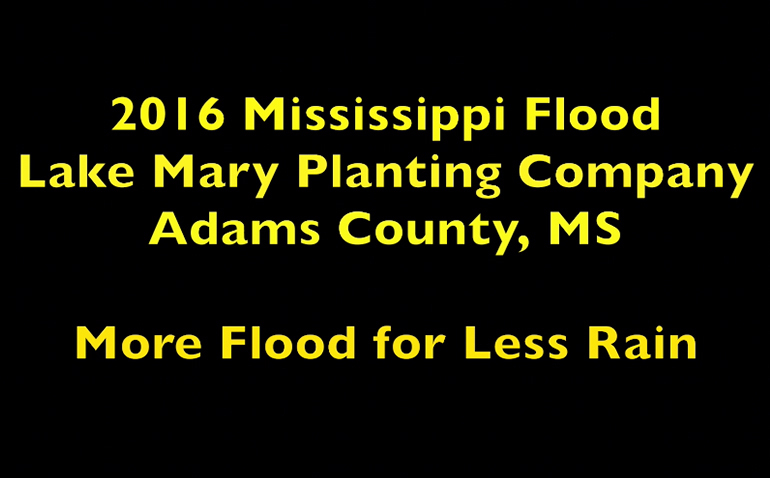 This will involve trade-offs: less flooding in Mississippi, more in Louisiana on the Atchafalaya. Some in Louisiana may like it. (Baton Rouge and New Orleans.) Some won’t. But that’s been the history of the river. Seems to me the change would also help the Corps tame the river a while longer – and keep all its flow from taking the shortcut down the Atchafalaya.